Lock in a great price for Hostal Oriola – rated 8.4 by recent guests! Location was pretty good. Sant Vicent is a nice village and the Cala Molins is really quiet and with clean waters. Just back from 5 days at the Oriola. Loved everything about this little gem of a find. 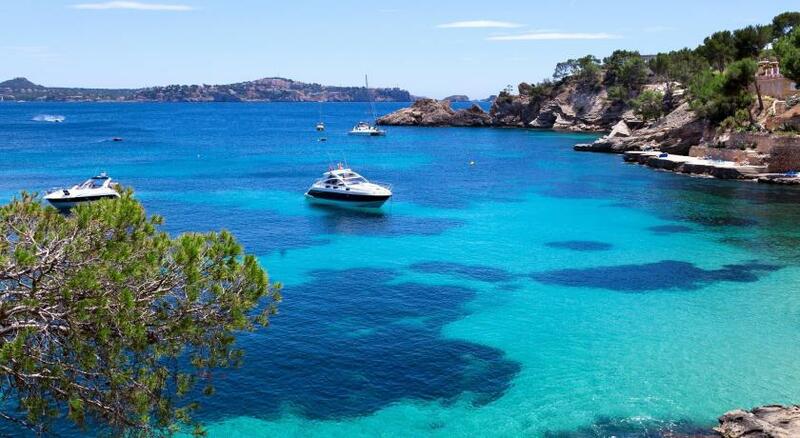 Close to the beautiful Cala Mollins beach. Perfect hosts Pepe and Ramon. Rooms basic but had everything you need and perfectly clean with friendly staff. Great location with a handful of restaurants close by and within easy access to other resorts via bus or a lovely walk through the mountains to Puerto Pollensa that takes about an hour. More than adequate continental breakfast served with a boiled egg every day. Lovely pool and area that we had to ourselves most days. Could not fault this small but personal hostal, which is actually in fact more like a hotel. Thank you Pepe and Ramon for a very enjoyable stay. Very good breakfast. Spacious and clean rooms. Nice balcony. The location was very good, with free parking on the street in front of the hostel. The beach was just a few steps away. Swimming pool. The placement of the hotel is close the beach. Personal was really nice, especially the owner Pepe. Breakfast was simple, yet it was really handy. I managed to book a room at the last minute and was surprised by the price difference between the Oriola and surrounding alternatives. The lower price certainly did not mean lower standards though. I found the Oriola to be a pleasure to stay in: a comfortable room with an en-suite bathroom that was cleaned daily, a very comprehensive breakfast with various options and all run by a very friendly and helpful team of staff. I would have no hesitation in recommending this place to others and will happily stay there again when I next return to Mallorca. They rock! Best place to stay in the north side of Mallorca. Great location just 150 meters from a perfect coast. Actually 2 coasts with perfect view and sea. Rooms are clean, comfy and large. Even if there is no aircon, you don't get warm at all. And the owners, Pepe and Ramon brothers: they have a great behaviour and this makes you feel at home. Will stay there again for sure! Perfect location, good family atmosphere, nice swimming pool, rooms very basic but sufficient, very nice helpful owners, close to the beach! Hostal Oriola This rating is a reflection of how the property compares to the industry standard when it comes to price, facilities and services available. It's based on a self-evaluation by the property. Use this rating to help choose your stay! One of our top picks in Cala de Sant Vicenc.Hostal Oriola features an outdoor swimming pool. This charming hotel enjoys a peaceful setting, just a 750 feet walk from the secluded beach of Cala de Sant Vincenç. Guests can soak up the sun on the nearby cove beach and bathe in the clear waters of the Mediterranean Sea. Guests can also relax on the sun loungers by the pool, surrounded by a lush garden. All rooms have a private bathroom and a fan. Some rooms offer views of the sea or the garden. The Oriola is run by the Noriega family and has a welcoming, family feel. Each evening you can dine on site with 3-course meal served in the hotel dining room. This property is also rated for the best value in Cala de Sant Vicenc! Guests are getting more for their money when compared to other properties in this city. When would you like to stay at Hostal Oriola? House Rules Hostal Oriola takes special requests – add in the next step! Other Hostal Oriola accepts these cards and reserves the right to temporarily hold an amount prior to arrival. Hostal Oriola accepts these cards and reserves the right to temporarily hold an amount prior to arrival. Please note that the guesthouse offers transportation to and from Palma Airport. Guests are kindly requested to inform the property at least 3 days in advance if they would like to make use of this service. Contact details can be found in the booking confirmation. Interior is a bit old and worn down but still clean! It's older hotel, so the furnishing was little older, doors were hard to open. very friendly stuff, location is excellent! No fridge(you can rent it for a good price). Prices on the bar was ok so we didn't need it. Staff not very flexible. I asked 1 hour extension on the checkout day due to it was something we needed but the response was negative in all senses. Also the breakfast a bit boring - same few things every day - but still met expectations since it was included in the price. And, about the ventilation in the rooms. The first night was so hot - first week of July - that was bit difficult for us to have a good sleep. The second day I had to ask a fan to survive the next nights. Spacious room, good balcony, very friendly and helpful owners.